A large range of lathe turning tools are available, allowing different types of cutting and shaping. The handles of turning tools are ‘substantial’, as they are securely held by the lathe operator, when in use. Leverage is often needed to ensure safe and correct use of the lathe tools. The long turned handles of lathe tools, are comfortable to hold and use. The blades of lathe tools are manufactured from carbon steel or high speed steel. Carbon steel blades are cheaper than high speed steel tools. They are good for general use, although they need sharpening more regularly. High speed steel tools are much more expensive, but they maintain their sharp edge for a longer period, which is particularly useful when turning hard, resistant natural woods such as teak. A roughing out gouge is used to remove the majority of wood when turning. It is useful in the initial stages of wood turning. Other tools are used to produce a more accurate finish. 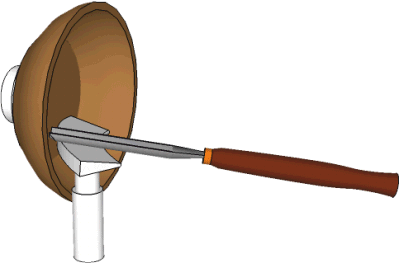 Diagram 1 shows a roughing out tool being used, to produce a cylinder of natural wood. Further detail is then added with other lathe tools. The tool rest should be quite close to the wood. Before turning on the lathe, spin the wood by hand to ensure that it does not ‘catch’ on the tool rest. Spindle gouges are also used for roughing out material, but in ‘tighter’ / smaller areas. A bowl gouge has a deeper flute than a standard roughing out gouge. Consequently, it can be used to remove material more rapidly and is particularly useful for turning hollows, when turning bowls and similar depths. 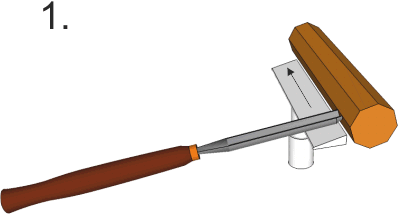 A bowl gouge is used to produce the internal shape of a bowl. The plain T-rest is replaced with a bowl turners lathe tool rest. This allows the wood turner to support the gouge / scraper, when turning the internal shape.